Ian Murray has put himself in a quite tough situation, wanting to take care of the sailors , but also needs and is being pushed to organize a Show with all teams racing on a leveled field. Artemis sadly is out of competition, although they might possibly appear, but there are only 3 teams capable to continue in full racing mode without handicap or any development excuse based on current rules. So if 2 out of 3 teams are challenging his two rules modifications without mutual consent and forced by the Safety Recommendations, it is clear that beyond any subjective opinion that Oracle is the only beneficiary of these changes, this is just an indisputable fact. Regatta Director Iain Murray met the media on Wednesday morning to address issues raised in the protests filed by Emirates Team New Zealand and Luna Rossa Challenge head on. Murray says claims that his 37 Safety Rules are changing the game one week before the regatta are baseless. But on June 28, Emirates Team New Zealand filed a protest with the International Jury over the changes. Yesterday afternoon, Luna Rossa Challenge did the same. Murray also states plainly that claims saying that the Italian and Kiwi boats would not measure as AC72s and are thus ineligible to race are false. He says the official measurers have informed him that both Luna Rossa and Emirates Team New Zealand are fully able to comply with the AC72 Class Rule. On the issue that seems to be most contentious to some of the teams, the requirement to have deeper rudders with larger winglets, Murray says these are important Safety Rules. That allows for a more precise setting in the prevailing wind conditions at start time. What the teams are protesting about now are features they had previously requested. 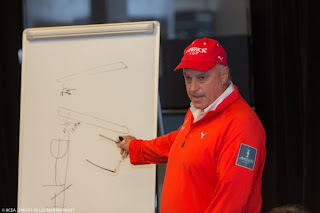 “Dean Barker, the skipper of Emirates Team New Zealand, emailed me in December of last year asking for the period when teams could adjust the rudder elevators (wings) to be extended from when they left the dock in the morning (under the original class rule) until up to the warning signal for racing (as it is now, under the Safety Recommendations),” Murray continued. “He suggested the boat would be safer, and easier to control, if the final adjustment could be made just before the race start. “Now can you see why I’m frustrated?” he asked. The protests say that Murray exceeded his authority in imposing the changes to the Class Rule without the unanimous consent of the teams. Murray said that when mediation failed he had no choice but to proceed with the safety recommendations. “I was appointed Regatta Director by the challengers, and accepted in that role by the defender. I work on behalf of all the teams,” Murray explained. “In this case, I’m really saving the teams from themselves. Not one team likes all of the recommendations. The International Jury is scheduled to hear the Emirates Team New Zealand protest beginning on Monday, June 8. There is no schedule yet for the Luna Rossa protest.